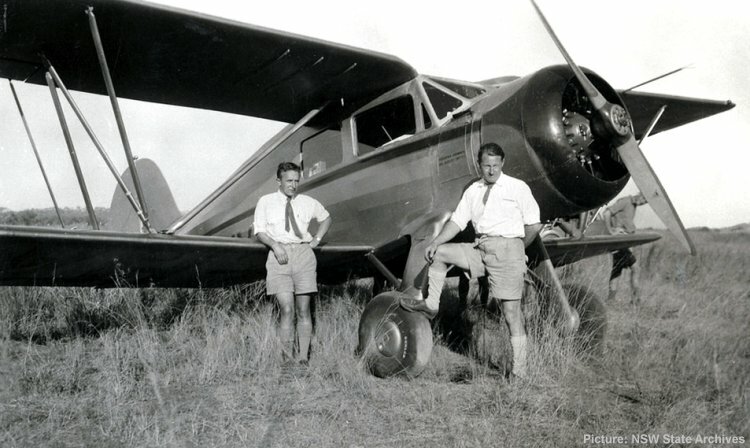 Waco YKS-6 VH-UYD with photographer Peter Payens (left) and pilot Norm Rodoni (right) in the Northern Territory sometime prior to 31 December 1941. On the 12th August 1940, Frank Follett had written to the Minister for Air to advise that Adastra were then carrying out work formerly executed by the RAAF on behalf of the Northern Territory Survey Committee. It seems likely that the aircraft was involved in surveying the route of the Stuart Highway from Adelaide to Darwin. This road was to assume enormous strategic importance after the outbreak of war in the Pacific. The aircraft carries the inscription "Adastra Airways Pty Ltd Air Survey Unit No. 2".